I like Dr. Bernie S. Siegel’s Exercise 58 in his book 101 Exercises for the Soul. This is fun homework. Get yourself a big box of crayons and a drawing tablet. 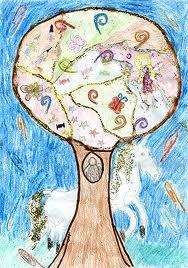 Step One: Draw a picture of an outdoor scene, and include a tree in your art piece. Let your inner-child come out to play. Oh, yes and Step Two: “What does creative vision say about you?